Media captionMark Carney: UK wage growth "anaemic"
Wage growth is falling, and the impact of Brexit on the economy is unclear, Mr Carney said in a speech at Mansion House in London. The pound fell sharply after Mr Carney's comments. Meanwhile, Chancellor Philip Hammond called for a smooth Brexit to avoid a "cliff edge" for businesses as the UK leaves the European Union. 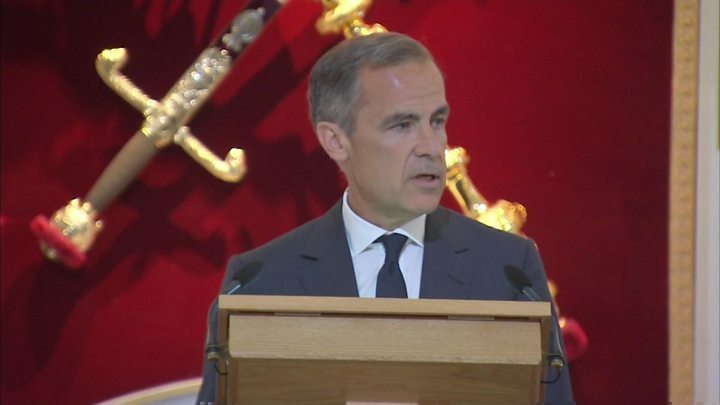 In his Mansion House speech, Mr Carney said: "From my perspective, given the mixed signals on consumer spending and business investment, and given the still subdued domestic inflationary pressures, in particular anaemic wage growth, now is not yet the time to begin that adjustment [rate rises]. "In the coming months, I would like to see the extent to which weaker consumption growth is offset by other components of demand, whether wages begin to firm, and more generally, how the economy reacts to the prospect of tighter financial conditions and the reality of Brexit negotiations." As Brexit negotiations unfold, the UK economy will be influenced by the expectations of domestic consumers, firms, and markets about any transition period and what will happen in the longer term, Mr Carney said. He said companies on both sides of the Channel may "soon need to activate contingency plans". "Before long, we will all begin to find out the extent to which Brexit is a gentle stroll along a smooth path to a land of cake and consumption," he said. Following Mr Carney's comments, the pound fell about 0.4% against the dollar to trade at $1.2682. The Bank governor warned that monetary policy, which is controlled by the Bank of England, "cannot prevent the weaker real income growth likely to accompany the transition to new trading arrangements with the EU". But he said the Bank's policy could influence how "the hit to incomes is distributed between job losses and price rises". Meanwhile, in his speech at Mansion House, Mr Hammond outlined priorities for a "Brexit for Britain", including a comprehensive free trade agreement for goods and services. He said the UK and the EU needed to negotiate "mutually beneficial transitional arrangements to avoid unnecessary disruption and dangerous cliff edges" from Brexit. The chancellor added that the UK needed "frictionless customs arrangements", especially on the land border between Northern Ireland and the Republic of Ireland. He said the UK would "almost certainly need an implementation period, outside the Customs Union itself, but with current customs border arrangements remaining in place, until new long-term arrangements are up and running". Mr Hammond added that the negotiations need to take a "pragmatic approach" to the export of UK financial services, and he warned against "protectionist agendas" dressed up as arguments about supervisory oversight. However, he said there were also legitimate concerns, such as those raised by the European Commission about euro clearing. Last week the EU revealed a draft law that would give it the power to move the lucrative euro clearing business out of London and keep it in the EU. Mr Carney echoed Mr Hammond's comments, saying that "fragmentation of such global markets by jurisdiction or currency would reduce the benefits of central clearing."